FULTON St. stop, come up to the next platform & exit thru the middle stairway to William St. When you get up to WILLIAM ST make a LEFT. You’ll see the Federal Reserve Bank ahead. Walk a few blocks down William St to Maiden Lane and make a LEFT. #75 is in the middle of the block, just before Jim Brady’s restaurant and across the street from the Federal Reserve Checkpoint. 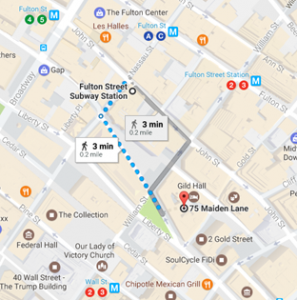 From the new Fulton St Station, walk South on Nassau St & make a Left on Maiden Lane. Walk past the Federal Reserve Bank & #75 is on your Left after “aka” and across the street from the Federal Reserve Checkpoint. From Fulton St Station, walk South on Nassau St & make a Left on Maiden Lane. Walk past the Federal Reserve Bank & #75 is on your Left after “aka” and across the street from the Federal Reserve Checkpoint.